First, I saw NAACP trending, followed by #NAACPBomb and #NAACPBombing. I finally clicked and found there had been a racially motivated bomb attack outside a Colorado NAACP office building yesterday. The hashtags are asking why no major news outlets have reported on the explosion which the FBI have called "deliberate". This is coming after the uproar surrounding the terrorist attack in France this morning. Most of the tweets using these hashtags are criticizing the mainstream media for their lack of coverage of the attack. According to the FBI, someone planted an in improvised explosive device on the wall of the group’s Colorado Springs office, right next to a gasoline can. However, when the IED exploded, the gosline failed to ignite meaning that there were no casualties. Daily Dot reports that though the FBI noted their primary suspect as a "balding white male who looks about 40 years old", major outlets like CNN did not mention the suspect's race. They add that the bombing received precious little coverage on TV the day after it occurred. Even some locals said they had barely heard anything about what had happened. "The investigation is ongoing and it is not known at this time if the NAACP or a business in the vicinity was the intended target. There are no known injuries at this time and minor damage to the building and sidewalk where the explosion occurred." 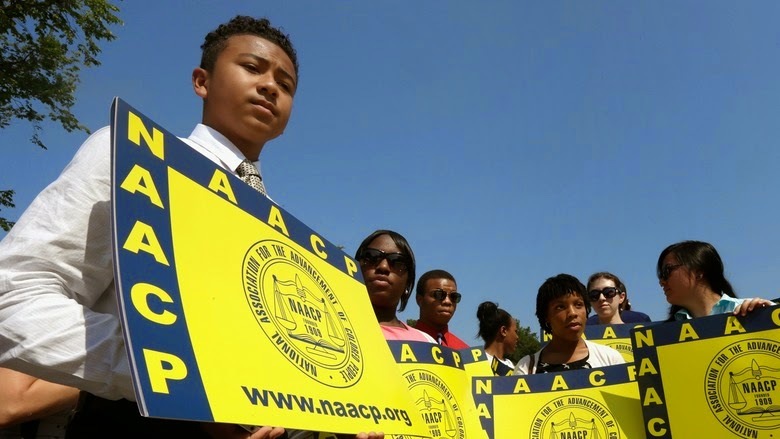 NAACP stands for the National Association for the Advancement of Colored People, and is one of the oldest civil rights organization in the United States, mostly speaking and supporting issues that concern black people in America. Other than the NAACP office, the nearest business was a barber shop in the same building. Carol Chippey-Rhanes, the NAACP branch director's assistant, showed some optimism after seeing the number of police, both federal and local, investigating the crime. It appears she did not want to over speak, but her comments seem to indicate she thinks it's a racist attack. She told USA Today. "We don't know what it was, don't know if it was directed at us. Of course, I doubt anyone was targeting Mr. G's hair studio." The outrage on Twitter wants to re-focus the conversation once again on the inequalities black people and black issues face in America, both in their personal lives - like in the deaths of Michael Brown and Eric Garner and non-indictments of their killers - and also in the media.